Levi Tolson was born in Ossett in 1891, the sixth son of Ossett mason contractor Wilson Tolson and his wife Mary (nee Horton) who had married in 1878. In 1891, the Tolson family were living in Headlands, Ossett and there were seven children of which six were boys. By 1911, Wilson Tolson was a widower, having lost his wife Mary in 1906, and the family were living then at Runtlings House, Ossett. The 5th (Service) Battalion of the Queen's Own Cameron Highlanders was formed at Inverness in August 1914 as part of K1 and came under orders of 26th Brigade in the 9th (Scottish) Division. They moved to Aldershot and in February 1915 went to Bordon. They landed at Boulogne on the 10th of May 1915. "Private Levi Tolson of the Cameron Highlanders, a well-known Ossett young man, the sixth son of Mr. Wilson Tolson of Runtlings House, Ossett, is reported missing, and believed to be a prisoner in enemy hands. In a letter his company officer expresses regret at losing him 'as he was a good fellow, in fact, a real Cameron - and the Camerons fight like tigers.' Private Tolson worked fro his father as a mason before enlistment." Levi Tolson's army service record has not survived but it is known that he enlisted in Ossett and was posthumously awarded the British and Victory campaign medals. He was not awarded the 1914/15 Star indicating that he did not serve overseas on or before 31st December 1915. 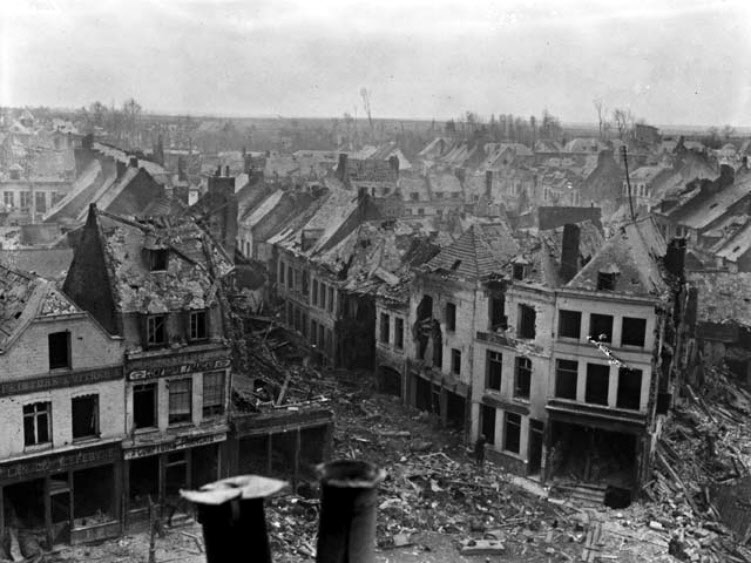 Above: Bapaume in ruins during WW1. Private Levi Tolson is remembered on Panel 74 at the Pozieres Memorial 3, Somme, France. Pozieres is a village 6 kilometres north-east of the town of Albert. The Memorial encloses Pozieres British Cemetery which is a little south-west of the village on the north side of the main road, D929, from Albert to Pozieres. The Pozieres Memorial relates to the period of crisis in March and April 1918 when the Allied Fifth Army was driven back by overwhelming numbers across the former Somme battlefields, and the months that followed before the Advance to Victory, which began on 8 August 1918. The Memorial commemorates over 14,000 casualties of the United Kingdom and 300 of the South African Forces who have no known grave and who died on the Somme from 21 March to 7 August 1918. The Corps and Regiments most largely represented are The Rifle Brigade with over 600 names, The Durham Light Infantry with approximately 600 names, the Machine Gun Corps with over 500, The Manchester Regiment with approximately 500 and The Royal Horse and Royal Field Artillery with over 400 names. 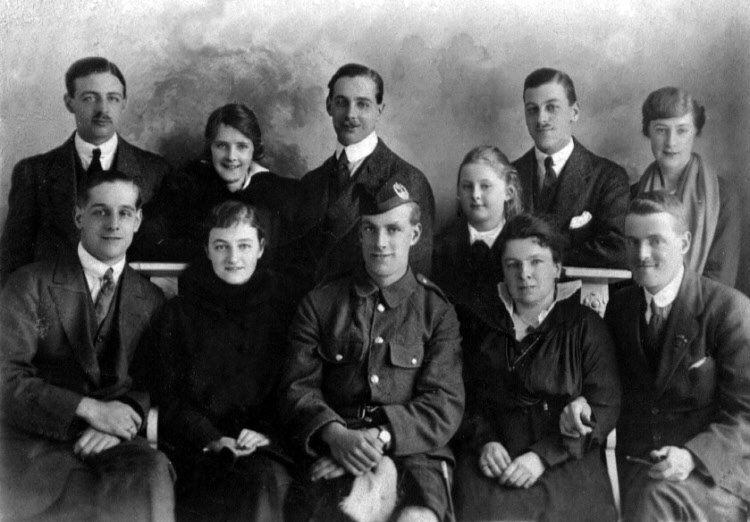 Above: The Ossett Tolson family with Levi Tolson in uniform bottom row centre. "Private Fred H. Tolson, the fourth son of Mr. Wilson Tolson of Ossett has been wounded in France. Describing in a letter to his wife, who lives in Industrial-street, Horbury, how he received his injuries, Private Tolson says that he was engaged in an attack on a German reserve trench, when a shell burst near him, and he received a bullet through the right leg. 'I lay where I was until I came round and found my leg had been hit. Three Germans then came out of a trench and gave themselves up to me. I motioned for them to come on, and they picked me up and carried me to our nearest stretcher bearers. I had my leg dressed and was then left in a shell-hole. The enemy then started sending heavy shells over, and I thought it wisest to try and crawl out of danger.' 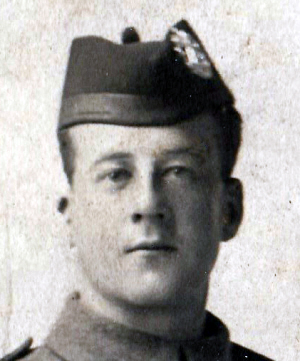 With the aid of two sticks he had picked up, he managed to hobble for three hours and a half, when he reached a dug-out, where several other wounded men were resting. 'We had been there about a quarter of an hour' he continues 'when two shells dropped on top and knocked it in, but I was lucky in not getting a scratch. I scrambled out, and carried on, plastered from head to foot, until I reached our trenches.' He added that he was mending nicely and expected to be sent to 'Blighty' in a few days." 1. Personal recollection of Levi Tolson's grand-niece, Nancy Dransfield as related to Alan Howe in August 2014.